Who will manage to get the bragging the rights in Asia? The battle to be the best in Asia is just about to begin as Sri Lanka will take on Bangladesh in the first match of Asia Cup 2018 at Dubai on Saturday, 15 September 2018. 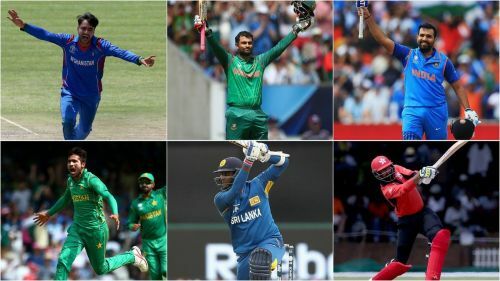 This year, the tournament will return to its original 50-over format having been played as a T20 tournament in 2016 so that teams can get into their groove before the T20 World Cup 2016. The defending champions, India, will begin their campaign on Tuesday, 18 September 2018 against Hong Kong under the leadership of Rohit Sharma with selectors opting to give Virat Kohli a rest due to his heavy workload. There have been many memorable matches which have been played in the Asia Cup with players giving their all to get the bragging rights over their neighbours. Here, we are listing down three of the most memorable matches played in the Asia Cup in the last decade. The fourth match of Asia Cup 2012 played between India & Bangladesh became memorable as soon as the Master Blaster, Sachin Tendulkar reached the milestone of 100 international hundreds. However, the innings was painstakingly slow as he reached his hundred in 139 balls and just when the master looked to accelerate, Mashrafe Mortaza prized out his wicket. MS Dhoni then gave India the required momentum playing a cameo of 21 runs off just 11 deliveries as India gave Bangladesh a target of 290 runs off 50 overs. Bangladesh's run chase didn't begin on a positive note as they lost their first wicket in the fifth over itself when their opener Nazimuddin tried coming down the track against Praveen Kumar only to get caught at extra cover by Rohit Sharma. However, after that rush of blood, Bangladesh played very sensibly as Tamim Iqbal & Jahurul Islam forged a 113 runs partnership to get their innings back on track. But just when it looked as if the match was getting out of India's hands, India scalped both set batsmen within a span of four overs. However, Shakib Al Hasan & Mushfiqur Rahim got together to get Bangladesh close to the target. Just when everyone thought, Shakib will take the match away from India, Ashwin got him stumped by Dhoni with 65 runs still to be scored in eight overs. India once again started to tighten things up with the scoreboard reading 33 runs required off the last three overs. It was then that Mushfiqur Rahim, the captain, decided to take things into his hands and smashed Irfan Pathan for two consecutive sixes scoring 17 of the 33 runs required and bringing down the equation to only 16 runs required in 2 overs. Dhoni gave the penultimate over to his best bowler on the day, Praveen Kumar, who crumbled under the pressure and bowled a waist-high full toss, a no ball, which Mushfiqur sliced for four. Mushfiqur sent the next ball into the stands and almost sealed the match for Bangladesh with Mahmudullah getting the honours to finish the match with four balls to spare.